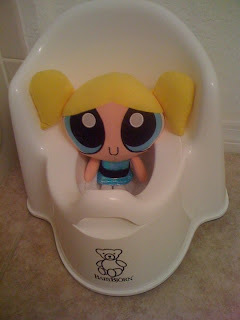 i LOL'ed at the powerpuff girl potty training. that's great. and yeah, i think summer blogging is slow, plus i think a lot of the blogs that were growing last year are really starting to slow down. life gets busy!! Glad to hear about the braces. Three weeks! That's great! As far as potty training is concerned. I have a few thoughts since I have survived this stage twice now to tell about it. One, use M&Ms, stickers, McD's Happy Meal toys or whatever floats her boat to incentive her into going. Also, pull-ups are just over-rated diapers. Plus, they are expensive. If they look like, feel like, hold urine like... they are a diaper. I am not planning on using them with my third. Throw these words back at me if you hear I am heading towards pull-up city. I am not a fan. Also, just be patient. This is a difficult stage. I have a niece that held herself for hours because she was being stubborn and didn't want to go. They will pull out the worst tricks sometimes to fight this stage. However, you and she can do it!! We have a Oldsmobile Silhouette and like it. We had a Chrysler Town and Country before it and hated to see it go after someone rear-ended me. :( If you or Mike wants to call at anytime to pick our brains about vans, feel free. We would be glad to help. We have had our vans since 2001. And as far as the looks, you just have to embrace the fact that your family is growing and you need to get a van. Vans are not that attractive and they holler, "FAMILY HERE!!!". But, what are you to do? Room is needed.